The full moon of Iyar, coming on the night of Saturday May 5, will be much larger and brighter than usual. This full moon coincides with the moon's closest approach to earth, called its perigee, when it will appear 14% bigger and 30% brighter than the average full moon. This is because the full moon will occur with the moon at a distance of just 221,802 miles (356,955 km) from earth, while the average distance is about 230,000 miles (384,400 km). Go outside around 7:00 PM near the end of Shabbat, and you will see this Supermoon rising in the east as twilight ends. Since there are no measuring sticks in the sky it can be hard to notice that this moon is bigger than an ordinary full moon. But when the moon is near the horizon it looks extra big anyway, for reasons that still baffle astronomers and psychologists, but on the night of a Supermoon, you should still be able to notice how much larger a Supermoon looks as it rises close to the horizon. Later in the evening it will be harder to tell that this moon is bigger and brighter than normal. Above the moon, bright Saturn shines next to Spica, the lucida of Virgo (Ha'btulah). Cruising high overhead in the constellation Leo (Ari) is ruddy Mars, casting its baleful glow over our "darkling plain swept with confused alarms of struggle and flight, where ignorant armies clash by night." To the west, the brilliant Venus shines above the setting sun, like a diadem in the crown of night. This full moon also coincides with the peak of the Eta Aquarids meteor shower, a remnant of Halley's Comet, where the earth sweeps through the debris field left by that comet in its orbital wake. The full moon will blot out most of the meteors from this shower, usually peaking at around 60 meteors per hour, but brighter members may still be seen. In any case, it should add a nice sparkling touch to the evenings stellar affairs. This special moon, planets and meteor shower should make for a memorable night of star gazing. We held a star party for a group from Wind River Systems last night. 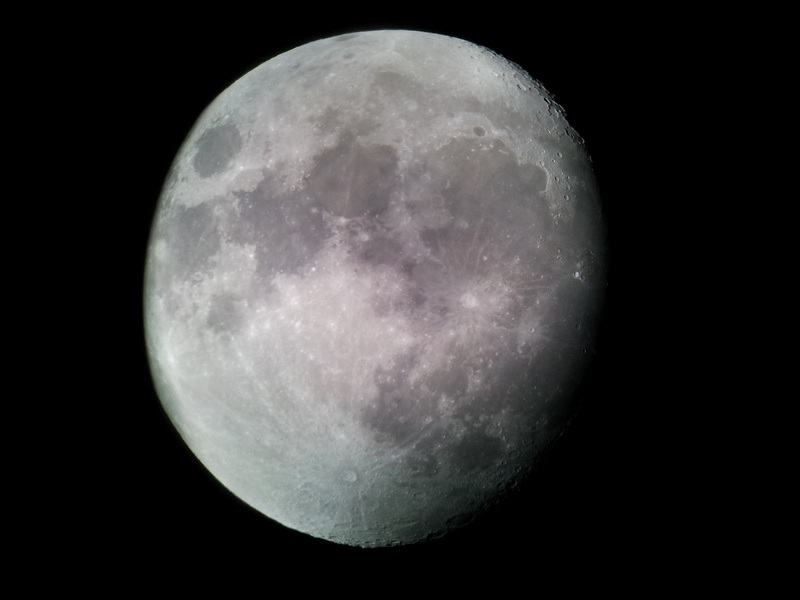 One of their number captured this image of the moon, 2 days from full, with his iPhone through our telescope. Remember to Keep on lookin' up and happy stargazing on Saturday night!